Happy holidays, everyone! Whoa wait, what? Who am I and what have you done with Ro? Yeah yeah yeah, so I’m not all bah humbug this year, what can I say? something about being a part of a happy family with a child, in the cold, with the scent of a pine candle on a warmer next to my computer has made me embrace the holidays like I haven’t done since I was newly sober and life was shiny and new. Hmmm, shiny new life, happy with the holidays. coincidence? I think not. Anyway, snow. The first time it snowed here a week ago, it felt magical. We woke up to everything covered in sparkling white, at least that’s how I imagined it. The kids had the day off thanks to the once monthly teacher planning day, and the sounds of happy children filled the air. I put on the heavy winter coat I bought at Value Village over my normal layers, added a heavy crochet scarf (granny squares sewed together that was supposed to be a bed coverlet that I gave up on) and my new fur lined boots and went outside with Jayden. We walked up and down the street with the kids and I marveled at the feel and sound of crunching underfoot. David’s ten year-old kept brushing piles of snow off Jayden’s nose. the kids filled a wheelbarrow full of snow from people’s cars to build an ice fort in the front yard of the house across the street from David’s. There was so much joy! Then I started feeling the cold and my scarf was getting kind of gross since I had it wrapped around my nose and mouth and did you know that cold makes your nose run? When we stepped into the house, my body instantly began baking in my layers, my boots squeaking as snow melted and I realized my feet, and Jayden’s, were wet and tracking snow into the house. Not so magical, I thought. I peeled off layers and dried our feet and settled in to drink coffee and read some Twitter while the kids played outside. When it was time for Jayden to have a pee, I bundled up, wrapped the scarf around my face, laced my feet into my boots, and went back outside to enjoy the snow again. David’s son came into the yard and pelted me with a snowball. It was on! I picked up the nicely packed snowball and rubbed it up, imagining red stitches against the white, my fingers across four seams. I narrowed my eyes at the giggling child at the plate, wound up and let fly. It went way left and was most definitely a wild pitch. A runner on third would have scored easily. All the ten year-old’s snowballs hit me squarely. Hmmm, this isn’t fun like I remember it the few times it snowed in Tucson when I was sighted, I thought, as a kid, or as an adult at the pool hall when we scooped snow off of cars to throw at each other since it didn’t stick on the ground. That night had been the first time I’d driven in the snow,, and last, unbeknownst to me. It looked like warp speed on the Starship Enterprise as the flakes were caught in the beams of my headlights. This time, there was no snowball fight with friends in a parking lot and no warp speed stars. the kids went off to a friend’s house and with no happy little voices frolicking around, just Jayden and me crunching around in the snow alone, we went inside to where it was warm and where David, accustomed to the Washington weather, waited with coffee and a hug. The snow turned to ice after some lovely freezing rain and temperatures, and I got used to bundling up for the minute it takes Jayden to relieve himself. Apparently, this weather hasn’t been normal around these parts for quite some time, though more snow is coming. Just in time for the frigid air, a big box full of winter clothes arrived on my doorstep from a Rays fan friend in Florida. She’d lived in the Pacific Northwest for awhile, and those clothes were going unused, so now I have a variety of sweaters to choose from, rather than this Rays shirt, or that Rays tank top, with this Rays hoodie, or that one. She even sent a hooded wool coat. thanks, friend! I think I’ll wrap this up and go make some chocolate peanut butter candy to see how the boys like it. I get to make Mom’s old favorite holiday sweets now that there are plenty of people to enjoy them. If you have a bone, can you throw it my way? Today did not start well. In fact it was steadily beginning to look ugly for anyone I might accidentally come into contact with, online, in person or over the phone so I unplugged from the internet, downloaded “11-22-63” from my Audible library and cuddled on the couch with Jayden for the rest of the day until it was time to make some dinner. I started crocheting Jayden a new mat for his spot under the breakfast bar, too. I saw the oral surgeon back on the sixth and we came up with a plan for getting my extractions. Unfortunately, the bombshell was dropped at the end of the appointment that the insurance had to approve the procedure and that could take four to six weeks. When I finished up with the antibiotics and discovered the soothing power of tea, it was looking like waiting wouldn’t be a problem. But the last few days the pain has begun to come back in the upper left part of my mouth because of the broken wisdom tooth there. The pain is going up into my ear and cheekbone. I’m not sure if the horrible vertigo I’ve been experiencing is all because of that or not but luckily I have my first house call tomorrow with my new nurse practitioner. Maybe she can give me some suggestions. I called the oral surgeon’s office this morning to see if they had heard anything back from the insurance but they didn’t answer so I tried calling the insurance and by the fourth person who couldn’t help me, I was seriously close to a meltdown. I called the oral surgeon again and she checked to see if they had gotten the approval but of course not. So I asked if I can just pay to have the one tooth out that’s causing all these problems. I never heard back from her. Escaping life and dissolving into the story of the man who goes back in time to save Kennedy helped me calm down. Luckily the nurse tomorrow is taking a urine sample, which is good since I’ve been eating Advil like it’s candy. This too shall pass, right? I mean, right? My friend Ricardo had mentioned that he wanted to reread “11-22-63” again after JFK has been all over social media and what not lately so he planted the seed. I ran across my post about it not long after and had to laugh when I read the part where I asked if the post would influence my reading the book again this year. Not sure it did, but I’m grateful for the book. You guys, I’m not sure how much more of this I can take. Oh yeah, I need a new neurologist and the one I wanted to see doesn’t take my insurance. What next, universe? I know I’m way behind travel posts several of you are waiting for. I haven’t felt well. Hopefully I’ll get around to them soon. Had to put this up quickly tonight since we only have through October to make purple infant hats. Please check out this link to read about why and where purple infant hats are needed. I just ordered baby yarn on Amazon. If you don’t know how to crochet, the post has links to some resources. I haven’t checked them out to see if they’re blind friendly. I’m excited to crank out some beanies! It’s too warm to crochet anything big so this is perfect. Back when I took the F2K Free Creative Writing course, I discovered how much I love writing short stories. After several lessons were under our belts, we were given a short story challenge. Participation was voluntary and if we so desired, we could try our hands at the guidelines. These were, write a story with a beginning, middle and end, one thousand words or less, containing these three objects: a blanket, a TV stand and an empty glass. I couldn’t believe the ideas these three objects sparked. Long time readers of my blog will be familiar with this since I’ve asked you to submit these objects that I call sparks for a few short stories here. The first story I wrote is dear to my heart and I had originally posted it on the blog until a fellow writer told me if I ever wanted to publish the story, it couldn’t be published elsewhere. I contacted one publication that focuses on the kind of material this story is about but they don’t publish fiction. I’ve decided the story doesn’t belong anywhere if not that publication or right here at the Roof. It has been just sitting in my computer collecting dust and a writer wants her creativity to be experienced by others. So, I decided Thanksgiving would be a good day to publish my first ever short story here. I hope you enjoy it! The sun was setting as I left, a slight chill in the air. My name was called from the direction of the smokers, and as I turned, I saw Troy breaking free of the haze as he tossed his smoke and jogged toward me. “Troy, congratulations my man.” I took him into a warm hug. “Pat, thanks. And thank you for being a part of this last year. I have a favor to ask you…” he trailed off, as if afraid to continue. He often called me is sober mom, since I was old enough to be. When he walked into the rooms a year ago, he was the shell of a boy lingering on the threshold of manhood. How things change, I thought. I urged him to ask his question by saying nothing, only squeezing his hand. “I watch you crochet those blankets,” he began sheepishly, “and I wonder if you’d make me one. I’ll pay you.” His eyes filled with tears and for a second, I couldn’t speak. I hadn’t expected that, the question, nor the show of emotion. “Of course I’ll make you a blanket but you can pay me by explaining why asking for it filled those beautiful baby blues with tears.” I grinned at him and he relaxed. “You got it darlin.” He had no other requests as to the pattern or anything, just shades of green. Interesting, I thought as I walked to my car. Over the next few weeks, I worked on his blanket. When I crochet something for someone,a little love goes in to every stitch. I thought about Troy and how far he had come, and a few tears even made their way into the strands of yarn. When the finishing touches were added, and the blanket washed, I called Troy and we met for coffee. Troy sighed and took a long pull on his mocha. “My mother crocheted me a blanket when I was 16. I mean, sure it was nice and all, but hell, I was 16. I wanted cds and nudey mags, you know? I don’t think I ever even used it, but I always had it, even when I left at 18, immersed in my drinking. I started dating this girl who found it and washed it and draped it over my couch. It looked so stupid. A crocheted blanket in shades of green on my stained, beat up blue couch,” he laughed and took another long pull of his mocha. I sat there, the warmth slowly fading from my cup. He stopped talking and flopped back onto the couch, fishing in his pocket for a cigarette. He tried lighting it with shaking hands, until I took the lighter and lit it for him. I didn’t speak and neither did he. When he was done smoking, I reached down and handed him the bag. He gingerly removed the blanket from the bag, lovingly caressing the different textured yarns in many shades of green. Finally he broke down, leaning forward with his head in the folds of the blanket arms on his knees, shoulders wracking with sobs. Now a grown man, unabashedly sobbing in the coffee shop. We could have looked like mother and son there in that hazy shop, as I set my cup down and wrapped him in my arms as the blanket soaked up his tears. When he had calmed, he sat up and gave me a winning smile, mouthing the words, thank you. I sat back and smiled. “How do we make amends to the dead? We live our lives with grace and dignity and maybe we recreate something we lost of them. Isn’t that what you did?” He laughed and said he hadn’t thought of it that way, but agreed that I was right. The sun was setting as we left the coffee shop, hand in hand, mother and son in sobriety, his story still swimming in our minds, a part of both our pasts now, and pushing us forward into the future, one day at a time. #NaBloPoMo – Another edition of Keyword Gems. Is your search query here? I knew I had one fairly easy post for NaBloPoMo and I’m cashing it in today. I don’t have time to write something from scratch, so I’ll bring you another edition of ‘They Landed Here’, which I’ve been titling, “Keyword Gems”. These are search queries I save that made me laugh at the time of finding them on my stat counter. In case you find that you’re one of the people searching for these terms, don’t worry, I have no way of finding out who you are. Stat counters don’t work that way. Below each query is the thought I had at the time of saving the search term. Hope you enjoy! Oh yeah, I copied this idea some time ago from VomitComet. Check out their “You are Here?” label for hours and hours of laughter! 20 May www.google.com what’s up with the world ending thing tomorrow? Now back to our regularly scheduled search queries. *Is my mind just in the gutter? This made me LOL for real. *I think you can just use your eyes to see us. *Just had to save this one for Carol. I wonder if the E on the end of your name was a mistake? Maybe there is a song about Carole. *How I learn know to write. 23 Jun www.google.com.au what would happen if there was no guide dogs? *A lot more white canes would be sold. *Absolutely not. I’m biased, but we’ve all got the same information on the guy. *They appeal to first and…paper beats rock. Strike three. *Not all the time but usually my guide dog knows what is best for me. 15 Jul www.google.com.vc WHY DID CAT WENT ON THE ROOF? *Maybe his litter needs changing. *”Seven” was a movie with Brad Pitt and Morgan Freeman. This search though, sounds like a “Friends” episode. *Yeah, I’ve got one too. *Yeah that’s about how I felt about that song, too. Ok, let’s definitely make blankets for Japan. Who’s with me? I haven’t had the mental energy to work on this, but I’ve been getting great responses. If you sent me a comment with your email, I have not published it so your email isn’t floating around. I’ll be emailing you shortly, after I get this post up. I’ve also been interested in knitting/crocheting blankets for Japan. The only other organization I was able to find doing the same thing was in England. However, they were collecting squares that would later be assembled into a blanket. Someone there had suggested contacting the Japanese Embassy to see where/if these blankets could be shipped. One thing to keep in mind is that at this point any ports that are open are going to be accepting the medicines and food stuff first. I guess that gives the knitters more time. Also, a note, if these blankets get made, avoid the color white as it is the color of mourning in Japan. Red is a good color as it represents good luck as is yellow. I want to help. I will be using the magic ball afghan and the lumberjack afghan patterns. They are extremely fast!!! Should I send them to you? Here are the links if you would like to do these blankets as well: Here and here. Thank you for the links and suggestions ladies. On the first post in the comments, there are ideas for how to get the blankets there too. I’ve already started on one, using this Granny Ripple Pattern. It’s a pattern I found before going blind and the only one I remembered. It crochets super fast because once you get the base row down, you’re crocheting into spaces, not stitches. Very easy to feel and do quickly. I stopped at Michael’s to look for Red Heart 1 pounders but couldn’t find them, so I ended up with Carom, I think. It’s also worsted weight 1 pound, and it’s looking like I’ll get one adult sized blanket out of the 2 pounds. I had no idea about color, so I got a light brown, B described as coffee with cream, and a light pink. Now that I know about how much I’ll need, I’ll go back for more. Thanks for the tip about white; I won’t use it. Here are my thoughts on this, crafters. When I went blind, everyone was here. Eventually everyone went back to their lives. Right now, everyone is running to help Japan but eventually, everyone will go back to their lives. Right now Japan is getting warm blankets from relief workers and such, but what about when they rebuild? They’ve lost everything. They will want pretty things, nice things. I would think that things made with love will be greatly appreciated in the months that follow. Hi everyone! God Bless you for your ideas and efforts..I found this site that lists the addresses of where you can send your blankets. My beautiful late Mom was from Northern Japan and I plan to send the blankets she hand crocheted to one of these addresses. I think for sure the blankets will be used and appreciated. Japanese people are very kind and honest. My Mom Loved Crocheting and Knitting! She said it was relaxing, an art form, and made gifts of Love. God Bless and everyone stay strong and love each other. So I think our efforts are definitely needed for the rebuilding. Who knows how big we can make this. I think the biggest obstacle we’re going to find is how to get the blankets there. Another comment said the Red Cross isn’t sending that stuff. We’ll need to research just how to do this. There was also another comment I’m going to check out, something about starting an organization. Maybe if we actually start an organization, we can get help with shipping, and if it’s all successful, we can keep it around for the future. My friend Erik has already said we have his technical skills if we need a website. I’ll try and do some more research and see what I can find but in the meantime, just start crafting. They need it for sure, and we’ll find a way. Oh someone had asked about sizes and I’m going to make baby, children and adult blankets. Looks like we had a good day last year working on the mail route and ignoring a little dog and not needing the cane. Sweet! This year is a recovery day this 15th of March. I’ve just been crocheting and chatting on the phone a bit. Jayden and I did get out to get the mail, since I like to get out at least once a day even if it’s small. I could not believe how sluggish I felt coming back. It’s not a long walk. But holy hell I felt like I was walking in quicksand. Managed to have a play session with the wubba and Jay was even cautious with that. Wow. Saturday definitely did a number on me. I need to write a post about the blankets for Japan with info I’ve gotten in comments, but I’m mentally jello right now. Hopefully later. I didn’t write on the twelfth last year, so today’s post is dedicated strictly to the MS walk Jayden and I participated in today with my good friend L. She picked us up at 8:30 this morning so we’d have plenty of time to arrive at the park and begin the walk at 9:30. It was a rough start when we arrived, since many walkers were there with their pet dogs. 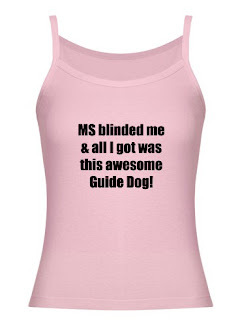 I’m pretty sure Jayden was the only guide dog, but only because the people I was with didn’t mention any others. Just trying to walk from the car to the registration area was next to impossible. Jayden just would not concentrate. Obedience didn’t work, so on went the Gentle Leader, which L laughed at, watching Jayden’s demeanor change haha! After that, he was whipped into shape and did great. While we were registering, one of the people at the desk must have read my shirt because he asked when I was diagnosed. We had a brief chat and then joined L’s friends from work, who had come to walk it with us. They were really cool and totally fawned over Jayden while asking me questions about how I stay healthy and keep my balance and such. I explained that exercise has done wonders for me. We stood and chatted for a bit and then things were getting underway. There was talking over a loud speaker, but I’m not sure what they were saying. Lots of people were cheering and a band started playing to send us off. At first we were in quite the cluster of people, but eventually it thinned out and we were able to pick up our pace. Though there were tons of things to see, Jayden showed me every curb and step until we were on level ground. L’s friends got a kick out of watching him and I kept hearing them exclaim from behind us. Once we really had a clear path, I put on my excited voice and slapped my leg, giving the high pitched hop up command. Jayden started literally trotting. It was so awesome! We kept having to slow up and go around people, but once we had the all clear again, Jayden began trotting happily. I’m not sure I’ve ever really felt that much spring in his step, at least not for long periods of time. Thinking back on it, this is definitely the longest we’ve walked just out and about, not stopping to shop, or out on a lesson with Dave. It was so incredible. I really got to just walk with my dog. The weather was beautiful until we hit a patch that was in direct sun with no breeze. It was probably a little over halfway through the walk. I decided we needed a water break and Jayden agreed, lapping it up and then rubbing my leg with his face. I decided to take the GL off since he’d gotten into his rhythm. It had really been awhile since we’d done anything other than our usual walks and Saavi trips, so I wasn’t angry that he had been hard to control in the beginning. As I watered myself and Jayden, L explained to her friends about how important it is that I not get overheated or too fatigued. We set off again and I tried pushing Jayden but he disobeyed me. One of the things I have gotten out of Jayden that wasn’t part of the deal, and something I haven’t really mentioned here, is his ability to alert me to coming fatigue. Dave noticed it a few times, where Jayden would slow down and Dave could see me starting to fade, but I haven’t noticed it without Dave until today. Jayden will absolutely refuse to let me push him. The first time Dave noticed it, I said Jayden must be tired. Dave informed me that no, Jay could probably run a mile, but I was fading. So today, when Jay disobeyed, I obeyed him and sure enough, about five minutes later, I felt the fatigue try to set in. I thought the two mile walk would be a breeze, since I do two miles twice a week at the gym. However it’s one thing to do two miles on a treadmill in an air conditioned room, and a completely different thing to do two miles outside in Arizona in March on non-level ground while working a guide dog and paying attention to where we needed to go. We even had a few street crossings, which I did human guide through, since the first one freaked me out haha! I didn’t think to make my friends stand and wait with me while I read traffic, and when L said to go, I couldn’t tell where the traffic was and freaked out. Because of the way we travel on a daily basis, we don’t do many street crossings, so I was out of practice. So back to Jayden refusing to walk as fast as I wanted; it was just incredible to really see him alert to my fatigue. Wow. Are these dogs smart or what??? We heard music in the distance as we approached the finish and L and I were singing silly tunes from our old choir days. As we drew closer, people were there cheering us on, telling us we were almost done. Jayden got a little distracted right at the finish and ran me into a person, but they were good natured about it and then we walked under the arch of balloons, completing the walk. People were cheering and Jayden was panting and my legs felt like jello haha! We said goodbye to L’s friends and found some shade to give Jay some more water. Then we loaded into the van on our way to Starbucks! Oh how I craved coffee, having not had my fill this morning. I got an iced venti mocha no whip, my favorite, and Jayden got a cup of ice. He practically ordered me to move my leg so he could sprawl out in the front floor well at my feet haha! I gave him a piece of ice between my sips of coffee and L and I talked about trying to do a walk every other Saturday or so. I sure hope we do that. It was so awesome to be out walking with Jayden in a safe place with my buddy. And Jayden just loved it. I love that bouncy feel in the harness handle. When we got home, Jayden enjoyed his frozen Kong while I did my stretches. I could feel the ache in my shins like I had at GDB, so I made sure to do the yoga stretch for that along with my normal quad and hamstring stretches. I called Gamma to let her know how it went. After that I filled B in and called Georgie. Both Jayden and I still had energy, but it didn’t last haha! I got on the computer for a bit and Jay crashed on the tile and then my body ordered me to the couch where I crocheted on the first blanket for Japan. At one point I got up and Jayden took my spot. When I came back I had him move to the other side which he did, but then promptly put his head on the pillow where I was about to lean back. I didn’t have the heart to move him, so I just stretched out beside him and leaned back on the arm of the couch. He was so passed out that he didn’t even realize it was dinner time. B and I said “food” a few times and Jay just looked at us. Finally I got him to get up long enough to eat and relieve, and now he’s back on the couch as I write this. It was an incredible day and it wore me out more than I had expected. I felt even more satisfied than I do even when I kill in the gym at Saavi. Not only did I get to walk with my dog and my friend in the beautiful fresh air, but I got to walk for my disease. I didn’t really chat with anyone other than that first guy, but we were all there for the same reason. Not everyone there had MS, but those who were there care enough about it to come and raise money for it. If I find out how many turned out, I’ll update with the number. It definitely felt and sounded like loads of people. Now I’m off to finish my coffee and crochet some more. My body still feels rather tired, but it’s such a good tired feeling. It’s good to give up some spoons for the cause of finding the cure for the spoon thief. Dirk Hayhurst makes a point I hadn’t thought about. He said since Japan isn’t a third world country like Haiti, people might not realize they need just as much help. He’s raising money on his blog in a very interesting way. If you donate to a link he set up and send him a screen shot, he’ll call you on Skype. Pretty cool, huh? I’d love to take him up on it, but my money is going to the Japan rebuilding blankets I’m hoping will really go somewhere. But if you don’t crochet or knit and want to help, check out Dirk’s blog. It’s just another way to make a difference. Ok, not gonna edit this, did the MS walk this morning and need to go crochet and recover. A blog post on that will be up by the end of the day.